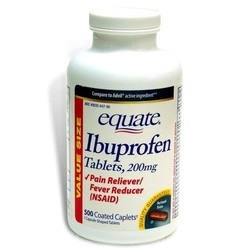 Ibuprofen is a useful medication which can be applied as an antipyretic , anti inflammatory and analgesic. In most cases, ibuprofen is useful in treating patient with osteoarthritis and rheumatoid arthritis. Ibuprofen will act as a reversible inhibitor of cyclooxygenase 1 /COX 1and cyclooxygenase 2 /COX 2.Ibuprofen will decrease the synthesis of prostaglandin ( PGE 2 and PGI 2) . Reduction in the level of PGE2 may lead to analgesia, anti pyretic and decrease in the production of gastric mucus which serves as a protection against gastric ulcers. There will be increase incidence of gastric ulcer. Reduction in the secretion of PGI 2 may also lead to an increase in the secretion of gastric acid which may lead to an increases in the incidence of gastric ulcer. Ibuprofen may not have an anti platelet effect due to its reversibility on inhibition of COX 1 and COX 2. The platelet able to replenish the TXA 2 level. The common side effects of ibuprofen amy include tinnitus, allergic reaction, hepatitis, gastrointestinal bleeding and interstitial nephritis.